ROW Adventures is excited to celebrate a tradition of cooking adventures! We offer several trips in our "Culinary Whitewater Rafting Series." On some trips we have a guest chef who accompanies the trip and prepares gourmet meals paired with their choice of fine regional wines. On other trips, we combine hands-on learning of campfire and Dutch Oven cooking focused on Northwest Regional Fare. Participants will be taught by ROW Adventures' talented guide staff and, sometimes, an additional skilled chef, to learn how to prepare gourmet meals in the wilderness. These skills include provisioning, packing coolers, the use of propane stoves, the art of Dutch Oven cooking and more! The skills learned can be used in for backyard cooking, on car camping trips, or other outdoor scenarios. Dutch ovens have long been used in the West. Lewis and Clark, sourdoughs of gold rush days and pioneers on the Oregon Trail all depended on these versatile cooking pots that allow a person to bake just about anything. Participants in our cooking adventure will learn all the tricks of Dutch Oven cooking with a focus on regional Northwest fare such as wild salmon, Pacific oysters, huckleberries, Idaho potatoes, mushrooms, apples and other fresh seasonal fruit, etc. Meals will be paired with Oregon, Washington and Idaho wines along with tasting notes of each featured wine. All participants receive a complimentary and handsome ROW apron to take home! Both The New York Times and Every Day with Rachael Ray have featured our culinary whitewater adventures! Click on the rivers below to open a detailed trip page for each river trip. Each day during meals you will experience the unique culinary aspect of the trip which is not mentioned in the itineraries below. 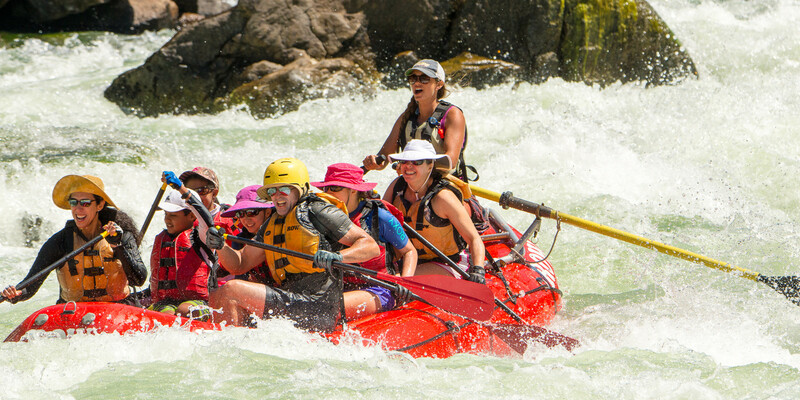 August 25-29 Five-days on Idaho’s Salmon River Canyons (River of No Return). A moderate class III whitewater rafting trip featuring camps on huge white sand beaches. To inquiry about dates, ask questions or book your culinary adventure today call 800-451-6034 or email info@rowadventures.com. Click on the rivers above to open a detailed trip page for each river trip. Each day during meals you will experience the unique culinary aspect of the trip which is not mentioned in the itineraries. ROW provides each guest with a packing list before the trip. For items you may not have, we've got you covered. Wetsuits and booties are provided at no extra charge for trips departing June through July 6th. We also supply sleeping bags, liners, sleeping pads and waterproof bags. On any river trip, the guides are the most important factor for your safety, enjoyment, and the success of the trip. ROW guides are exceptional people with years of river experience. We maintain a tobacco-free policy and most of our guides have taken interpretation courses from certified instructors. We look for guides who are willing and eager to share, teach, listen, learn, laugh, play, discuss, and, above all, work hard to provide a safe, relaxed and spontaneous adventure. Should you have to cancel your trip plans, deposits are non-refundable. After the final balance due date all payments become non-refundable. Alternate guests are welcome. Please understand that we cannot insure your investment in river trip reservations. We strongly recommend the purchase of trip cancellation and interruption insurance. Once you sign up, we lose the right to sell your reserved space to other individuals or groups. Our number of trips and spaces per trip are limited by river management plans. Therefore, we regret that we cannot make exceptions for personal emergencies. Should you decide to cancel your trip with us, your trip cost is not transferable to another year. Can I purchase Travel Protection? Cancellation and interruption insurance can include full refund should you cancel due to health, medical, or several other reasons. If you cannot afford to forfeit your reservation investment, you should purchase trip cancellation insurance. You can purchase this coverage by completing the credit card authorization form and / or by calling our office and we can assist you in the purchase of this insurance.